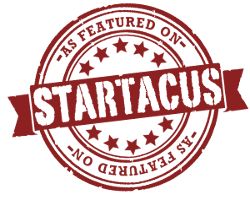 Here at Startacus we love highlighting all those places, self starters and startups that provide us all with that much needed inspiration for making starting, growing or sustaining a business as easy as possible. From our weekly features and interviews through to our acclaimed self starter of the week and startup of the week awards, we're on a mission to showcase and sing the praises of as many of you good folk as we possibly can. And if you happen to be one of those good folk that has been featured on Startacus, you'll be hopefully pleased to discover that you can now highlight your feature on Startacus to your own communities, customers and followers thanks to our “As featured on” badge and link which you can add it to your own website. Yay! We've done all the difficult stuff below to make this process as easy as possible for you, but don’t worry if you get a little stuck, we are happy to help! Also, we would be delighted if you dropped us a tweet to @iamstartacus or an email to iam@startacus.net to let us know when you have done it! Simply use the HTML code below. If you want to link directly to the actual feature / article replace the href attribute with the desired url. As we're a good bunch here at Startacus, we've given you a couple of different sizes and colours to choose from. If you don't have access to your HTML code then feel free to download one of the images from the links below and use it as a link to your article or even the Startacus homepage.